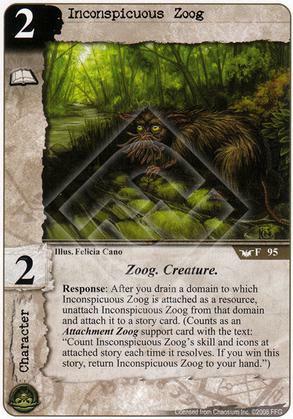 So, it looks like Inconspicuous Zoog isn't actually committed to the story when it is attached. Therefore, it isn't vulnerable to insanity/destruction from resolving the story struggles, right? But remember that there needs to be "normal" character commited by active player in order for story to resolve. This Zoog attached alone will not cause story to resolve. One of the better Zoogs for sure. That's not to say its actually good though. If this had one more icon I might consider using it, there are better characters with similar impact on stories so I see no reason to run this. I'm thinking of pitting a Shub-Zoog ramp deck against a Misk-Zoog rush deck. Thoughts?